When you start looking through the bridal magazines, you will likely notice that most of the models have long hair. This allows them to wear any type of hairstyle, from an updo to soft and flowing. Long hair can also be styled to accommodate any type of headpiece. 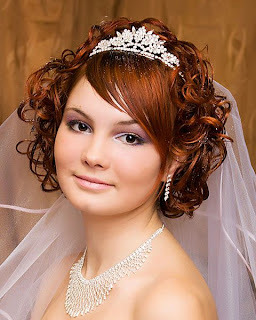 But not every bride has long hair, and there are certainly some wonderful headpiece styles available for short hair. One great style to shop for is a headband. This type of headpiece fits to your head, and doesn't need the hair to provide an anchor. A headband could also serve as a base for a veil instead of the usual comb. Headbands come in numerous styles. A wide fabric covered band has a classic, innocent 1950s look. A dainty headband can be covered in Swarovski crystals and pearls for a more contemporary look. A great idea is to coordinate the details of your headpiece to your custom bridal jewelry. If you are choosing to wear a headband, beware of styles with flowers attached, as they can make you look like a flower girl. Another easy-to-wear style for short hair is a wreath. Wreaths tend to work best for brides with an earthy style, or those having Medieval themed weddings. They can also be a terrific choice for a tropical destination wedding. Fresh flowers are one possibility, but they can be the toughest to pull off. One reason is that fresh flowers can just be too big to wear on your head, and there is the wilting issue, as well. A better option is tiny paper or porcelain flowers. They can be woven to create a wreath that is much more dainty and wearable. A wreath made of lasting materials is also nice if you have a sister or friend who might want to borrow it for their wedding in the future. Depending how short your hair is, there are additional types of bridal headpieces that may work. If you have enough hair to pull the front back, you will have a world of options. Your hairdresser can use a clear ponytail holder to sweep back the front section of hair, which will give you a place to anchor your headpiece and veil. Pieces attached to combs will tend to work very well with this hairstyle, and they are plentiful. You will have your choice of a wide variety of designs. For a formal wedding, a comb adorned with beautiful materials like crystals and pearls will be perfect. It can be low to the head, or have more height like a tiara. If your custom bridal jewelry is more glitzy, then choose a comb with crystals and rhinestones. A more demure bride could select a piece handmade with sterling silver flowers and tiny seed pearls. If you coordinate your headpiece to your bridal jewelry, it will look perfect. A full tiara may not be the best choice for a bride with short hair. For one thing, it will be difficult to stabilize the weight of the piece without a lot of hair to put the side combs into. The other factor to keep in mind is that a giant tiara will just be overwhelming if you do not have a big hairstyle to balance it out visually. 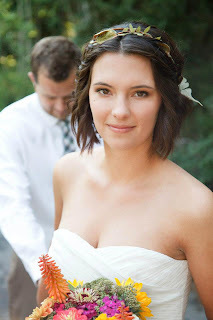 Brides with short hair will also definitely want to rule out hairpins as their ornament. The ends of the pins are likely to show, and they are sure to fall out of your hair in short order. Having short hair does not mean that a bride cannot wear a headpiece or veil. Happily, there are numerous styles from which to choose. Whether your style is classic, contemporary, or earthy, there will be a perfect headpiece for your wedding day.